On 27th July 1845 William married Mary Ann Norman from St Georges East in London in The Parish Church, St Catherines, London. On the 1851 census she was described as a waistcoat maker. They had twelve children together over a twenty year period between 1843 (pre marriage) and 1863. 1871 census - not found ? On 26th August 1887 it is presumed he took the train to Ilfracombe for a holiday. It was from the quay here that he took a fatal pleasure boat trip with other holidaymakers and met his death. His death certificate, issued by the Coroner in Ilfracombe, Devon, says the cause of death was because he “accidentally drowned by the capsizing of the pleasure yacht Monarch”. The inquest was controversially held less than 24 hours after the disaster, so it is not entirely suprising that the certificate says he was 65 years old rather than his actual age of 63 ! His Will was proved by his wife "the relict (during life)" and his friend, Walter Rye of 16 Golden Square, Middlesex. He left £20,354 which, if you use the retail prices index to work out how much that is worth today, would be in the region of £1.85m. 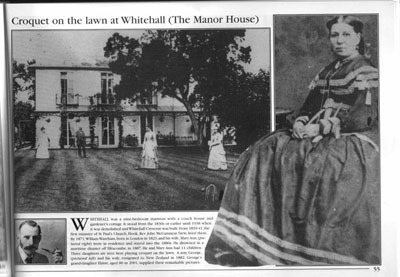 His wife received £100 for mourning plus a further £500 and the "free use of my freehold mansion (sic) house "The Manor House" aforesaid and of the gardens and pleasure grounds, coachhouse and stables and of the furniture, plate linen, china, books and other articles of household effects in and about the same for one year from the time of my decease" or shorter ...... (depends on whether Trustees use their powers to sell before the 12 months has passed). £12,000 from the proceeds of selling all his unbequeathed assets was to be invested and his wife would receive interest at 5% per annum for life. The Will says William had been a "Dealer in works of Art" and had a business at 14 and 15 Castle Street which he left to his son in law, George Robinson Harding. He also owned building plots on the Southborough Parish estate which he instructed his trustees to hold until let to builders. The children split the residue of the estate equally. On the 25th August by the yachting catastrophe at Ilfracombe, WILLIAM WAREHAM Esq., of Manor House, Hook, Chairman of the Kingston Highway Board, and J.P. of the same Borough, in his 63rd year, most deeply regretted and mourned by all who knew him. Friends will kindly accept this intimation.